There are different images of the Day of Judgment presented in the Scriptures. Some are quite unique and strikingly different than often portrayed in art and hymnology. 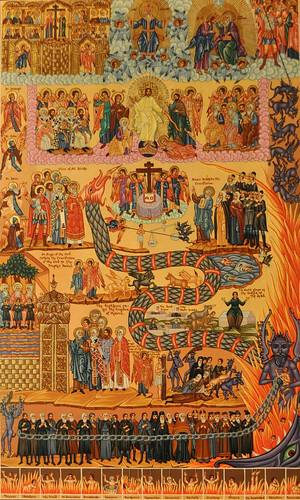 The Gospel reading for the Sunday of the Last Judgment (Meatfare Sunday) – Matthew 25:31-46 – is a good example of a very different image of the Last Judgment. This Gospel lesson occurs within a series of parables that Jesus tells. In this case, the Lord Jesus presents a judgment not based on sins which violate God’s commandments, but rather based on whether people showed mercy to those in need. 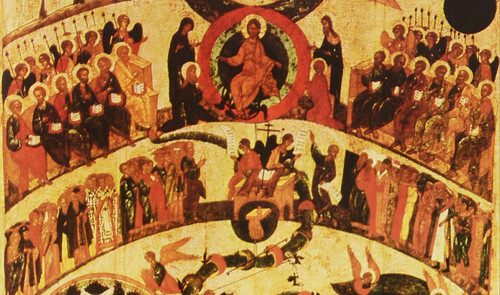 We see in the Church, that diverse Scriptural images of the Last Judgment were readily combined together to form a picture of the Judgment Day. So the hymn above speaks about the river of fire, though that is not mentioned in the Gospel lesson for the day. The hymn for the day is based more on Revelation 20:11-15 than on Matthew 25. Besides the various images of the Judgment Day we find in Scriptures, the church fathers provide a variety of interpretations of the Matthew 25 text of the Judgment. St Simeon the New Theologian offered perhaps the most unusual interpretations of the text (see my blog series St Simeon the New Theologian on Matthew 25:31-46). He was concerned that monastics might feel judged and excluded from Christ’s blessings for focusing their lives on repentance rather than on acts of mercy – so he radically reinterprets the parable to be about repentance not acts of mercy. He has it that Christ is hungering for our repentance but we don’t repent and that Christ lies abandoned in the home of our hearts where we refuse to visit Him. For Chrysostom not only are the sinners going to experience eternal physical torments, but they will also be able to see the blessed ones rejoicing in the Kingdom and so will be fully cognizant of what they are missing – a double torture. Additionally, they will realize how wrong they were and repent and experience grief for their sins but it will be of no benefit to them but will only add to their suffering. All of the torments are easily avoided simply by showing mercy to those in need, for as Christ taught, “Blessed are the merciful, for they shall obtain mercy” (Matthew 5:7).